Be ready for all your special occasions (even the wild ones) with your 10oz Double Wall Insulated Acrylic Wine Tumbler from Southern Homewares! We make it easy to enjoy your favorite drinks, anywhere! Encased inside the clear acrylic outer shell, you can see the shape of the wine glass within. Super cute, and functional! Add a lid that keeps everything in the right place, and you’ve got a recipe for a great time! Order yours today, and enjoy your drinks, wherever! Be ready for the good times, wherever they take you! It has never been easier to have a safe, secure, and fun wine glass that travels with you anywhere and never lets you down! Introducing Acrylic Double Wall Insulated Wine Tumblers from Southern Homewares! Now you can enjoy your favorite wines poolside, on the boat, or just about anywhere… without worrying about fragile glass. Perfect for trips to the golf course, exciting parties, or hot summer days, these tumblers live up to the hype! – And they’re fun to boot! Encased inside a clear acrylic outer shell, is the shape of a wine glass that holds your drink. The result? – You can see your wine through the tumbler, and it looks classic, classy, and cool. Simple as that! 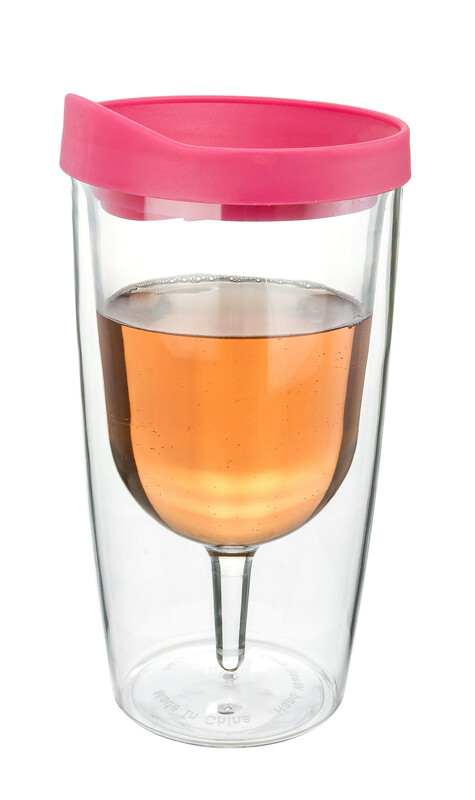 Not to mention that your new favorite on-the-go wine tumbler comes complete with a pink lid that helps you keep your Rose and White Wines cool and refreshing! And the chances of a party-ruining spill? - Forget about it! And of course… Good luck breaking it! Clear Acrylic construction gives you durability you obviously can't find in any other wine glass. When you’re done, just throw it in the dishwasher and keep it ready for the next shindig. Tailgating, sports, the beach, wild nights… perfect for all of the above! Order yours today! – With all these functional and fun features, it also makes a pretty darn great Gag Gift or White Elephant too! Double wall insulated. Tumbler comes with a pink colored lid. Dishwasher safe. Overall dimensions are 3 x 3 x 6". Includes one tumbler.